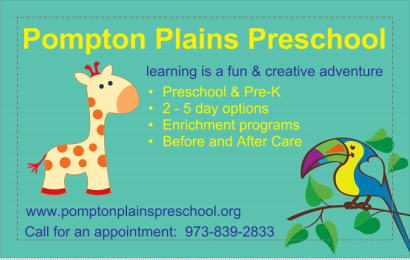 Pompton Plains Preschool is a State certified non-profit organization providing preschool education since 1946. Pompton Plains Preschool teachers and staff members provide a warm, safe and nurturing environment for your children. Our dedicated staff continues to develop a creative curriculum to ensure it is customized for each new group of children. ​Our programs are tailored to fit the developmental, social and educational needs of our students. We have created a structured learning experience to ensure your children are excited, self-confident, socially ready and fully prepared for their full day of kindergarten and future learning. We are not a daycare facility. We offer full academics, daily enrichment, social skills development and etiquette. We offer many wonderful enrichment programs: Mrs. Garcia's language arts, Melody Mom's music, Tumble Zone, Science, All Sorts of Sports, Building, Garden Club, Art, Cooking & Fairy-tale workshops. The Scribble Garden, "Fairy Lady" Fairytale programs are integrated into our Enrichment Programs, Camps, Cooking Classes, Sewing Classes, Fairy, Pirate, Knights and many more.